Here, once joined up, you can attempt the various challenges. The Biscuit Joconde Entremet was one of the challenges that Lisa completed and, I have to say, to such a professional standard that I could only stare open-mouthed at the photographs of her creation. I have yet to sign up to be a Daring Baker. They have rules and time limits and a) I would have to print them out because I would unwittingly break the rules and get into trouble unless I had them in black and white in front of me and b) I don’t have enough time to deal with time constraints! I’m like my dad – I have to mull things over with a nice cuppa (or six) first. I have to check and re-check, think it through, plan and devise. This can be a week/two week long process which, by then, the time limits would be up. I think I’m time-challenged. Maybe I’ll join up to the Daring Kitchen, sit back and watch for a while and sign up once I get to grips with the idea….and find another ten hours in a day! BUT, in the meantime, what with D’s birthday and the decision NOT to bake a cake (as he’s not a big cakey-bakey fan), I decided that THIS might be the ultimate birthday dessert. And, oh my, doesn’t it sound posh too? Hmmm, when I showed him the pile of papers, weight conversions (from US to UK), the adaptions, the plan and THE photograph, what did he do? Yup. Laughed! True, I did too, but I realised if I could pull this baby off, I could do anything in the kitchen and maybe, when I can’t keep the pace in teaching anymore, I could sideline into fancy-pants desserts? Who knows? Maybe Raymond Blanc will need an ageing ex-teaching patisserie chef one day? Ooh La La! So, here’s what I am aspiring to. This is NOT my photograph, it is taken from lisamichele.wordpress.com: TRULY stunning. If mine comes anywhere near to looking like this, I’m going professional! 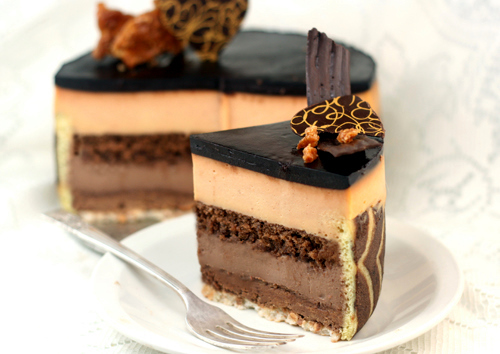 I will take you through each section of the entremet daily. Today I will begin with the Biscuit Joconde. Clearly, not a great photograph, but this is finished baked sponge/biscuit joconde imprime. Technically for me, this was a huge challenge. NEVER have I attempted anything quite so complex. In France, La Joconde means ‘Mona Lisa’. The world-famous painting Mona Lisa, Leonardo da Vinci’s masterpiece, is supposed to be the portrait of the wife of an Italian merchant, Francesco di Bartolomeo del Giocondo. Due to this, it is known as La Gioconda (La Jaconde in French). Da Vinci visited France in 1516 or 1517 as the guest of King François I, consequently remaining there until he died. The Mona Lisa was held in very high esteem by the French. 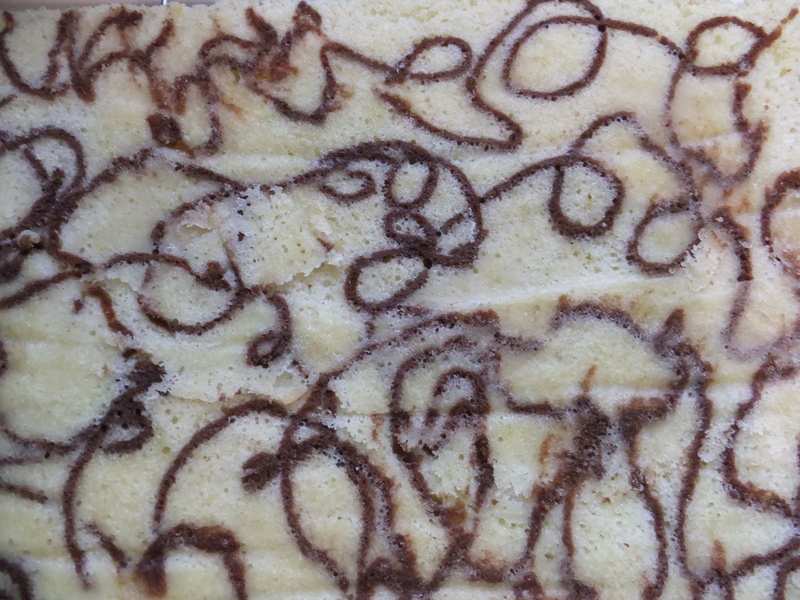 Joconde, the name given to this type of sponge cake, is given to show how highly regarded it is amongst pastry chefs. The Biscuit Joconde Imprime comes in two parts: the Joconde Sponge and the ‘Imprime’ Joconde Pattern Paste. The Imprime is the ‘printed’ pattern, baked into the Joconde. 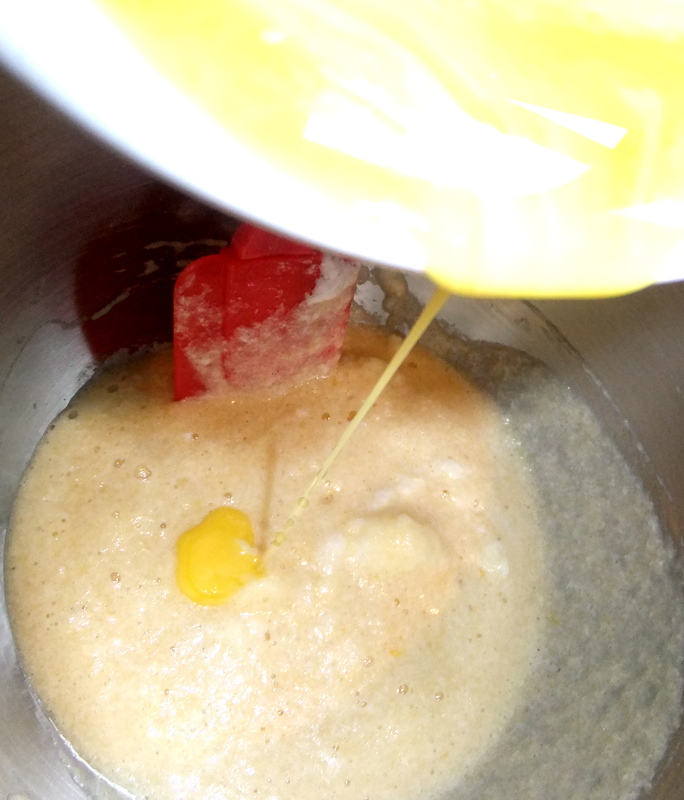 * Mix the egg whites and the caster sugar into firm glossy peaks. 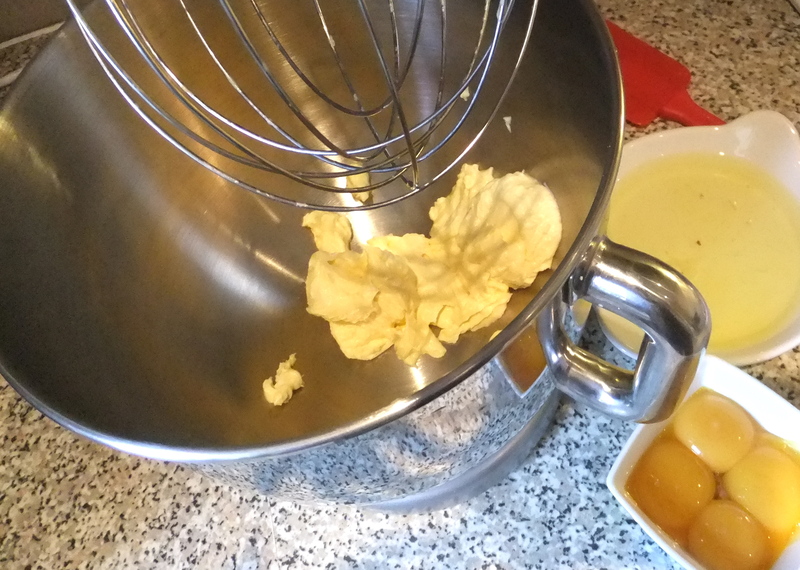 Mix egg whites and caster sugar into peaks. * Sift almond flour, icing sugar, self-raising flour. 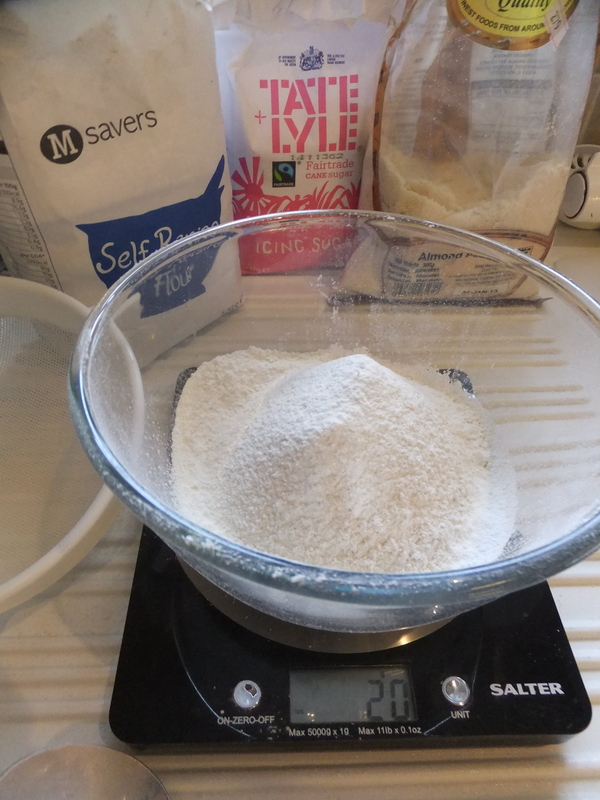 Sift flours and icing sugar. * Add the whole eggs a little at a time. Mix until smooth and light. 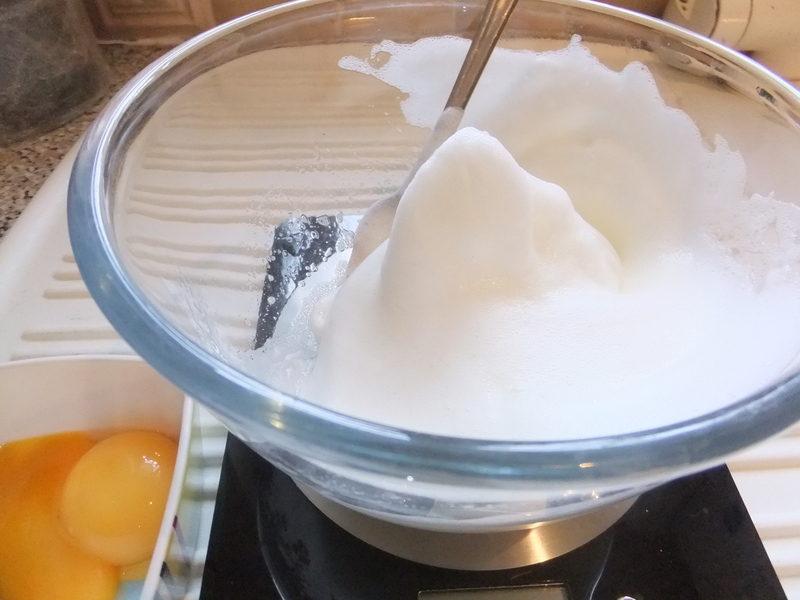 * Fold in the whipped egg whites gradually. Start with a third, then add the rest. Resist the temptation to overmix! Add the melted butter and fold in gently. 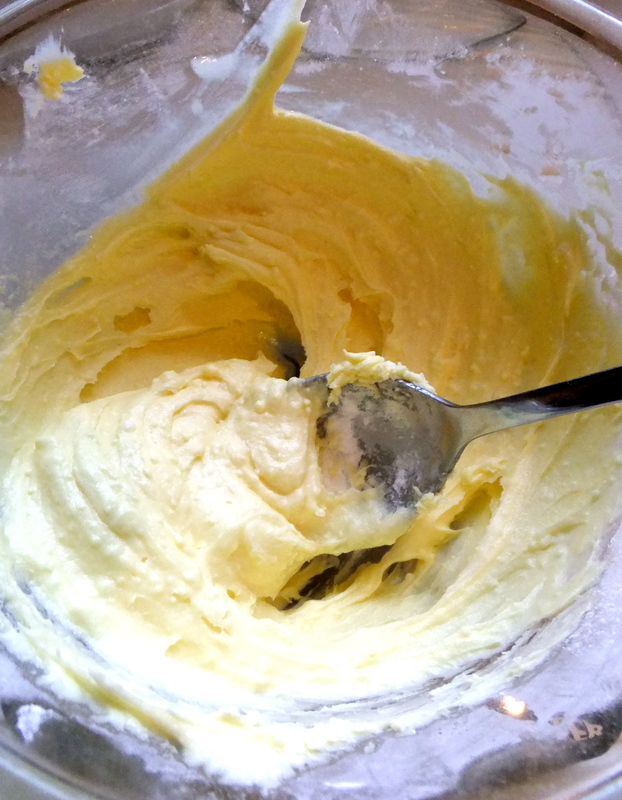 Fold in whipped egg white, then fold in melted butter. 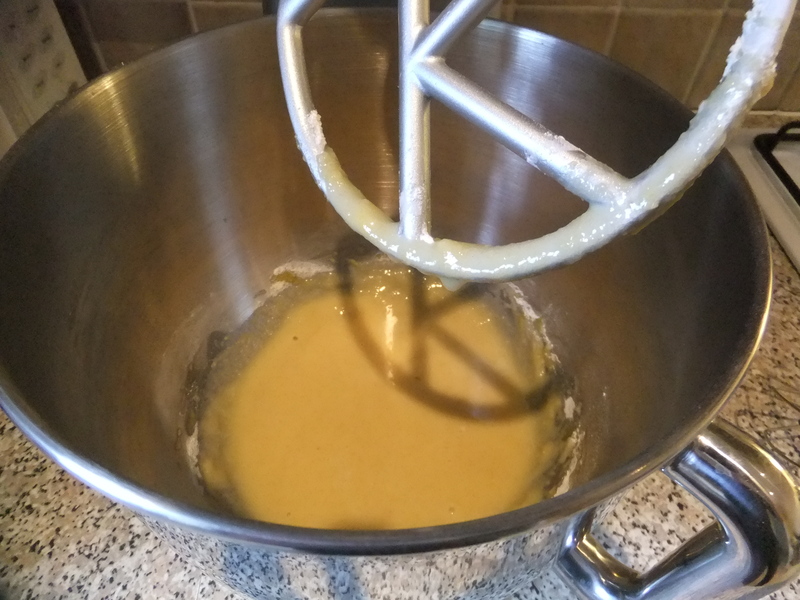 * Reserve the batter – you will use this once you have made the Joconde Imprime paste. * Cream butter and sugar together until light and fluffy. * Gradually add egg whites. Beat well. Gradually beat in the egg whites. * Sift flour and cocoa and then fold into the butter/egg white mixture. 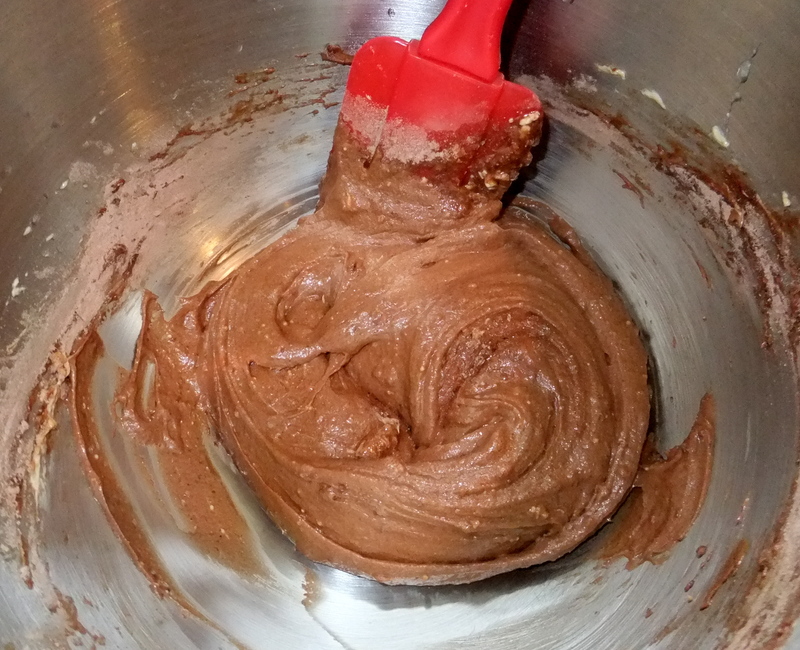 Fold in sifted flour/cocoa powder until smooth. 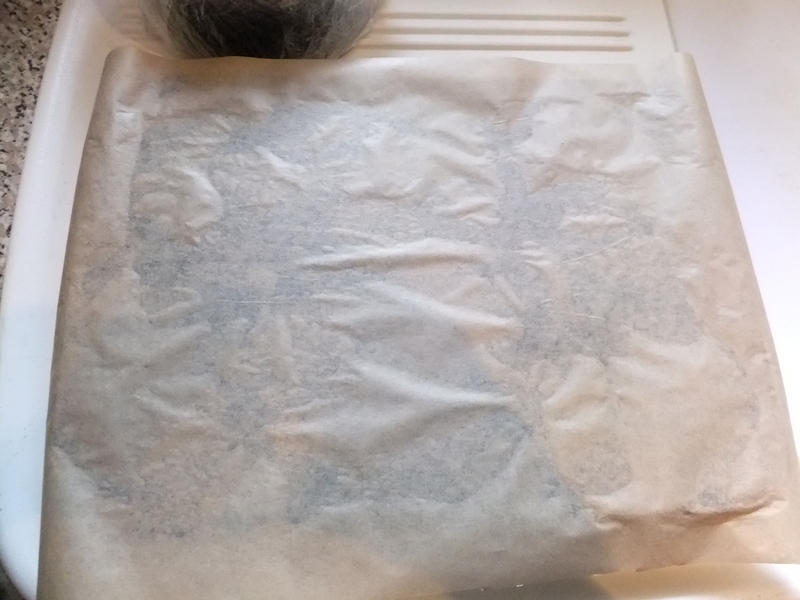 * Squidge a flat swiss roll tin (I used the back of a flat roasting tin) with a quick spray of low-cal spray and then line with baking parchment. I then greased the baking parchment too. * Fit a disposable piping bag with nozzle of your choice and fill the bag with your Joconde Pattern Paste. Pipe the pattern across your baking sheet. You can, alternatively, spread the paste over your sheet and ‘scratch’ patterns in using scraping tools, cutters etc. 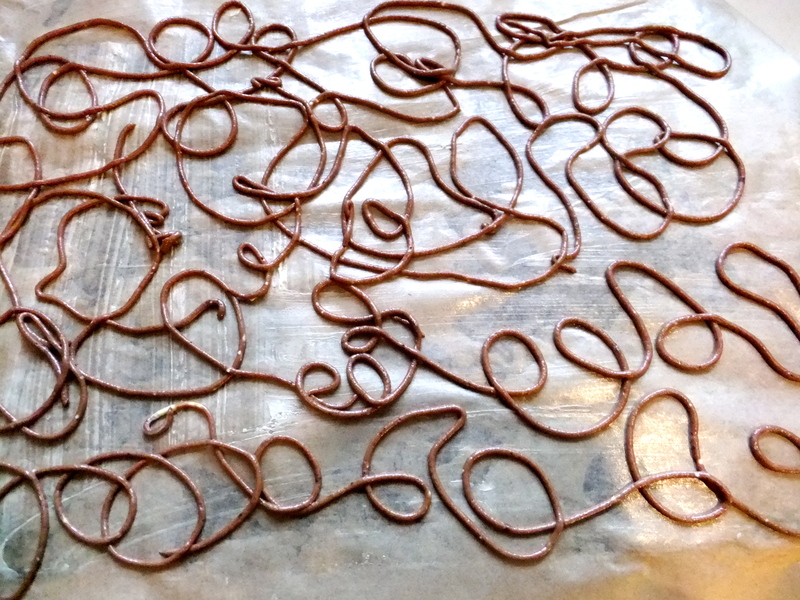 Fill a piping bag with pattern paste. Pipe the pattern onto your tin. * Once you are happy with your design (or scraping! ), place the whole thing (tin and everything) into a freezer and leave to set HARD. If it is not hard enough, the pattern paste ‘blobs out’ during cooking. * Remove the frozen pattern paste from the freezer. Now you need your reserved Joconde Sponge mixture. Very, very carefully, spread this over the top of your pattern using a spatula. It needs to be as thin as you dare – about 1/2 inch thick. When you are happy, bake in a medium oven (I used 160 degrees C) for around five minutes. It requires attentive baking. 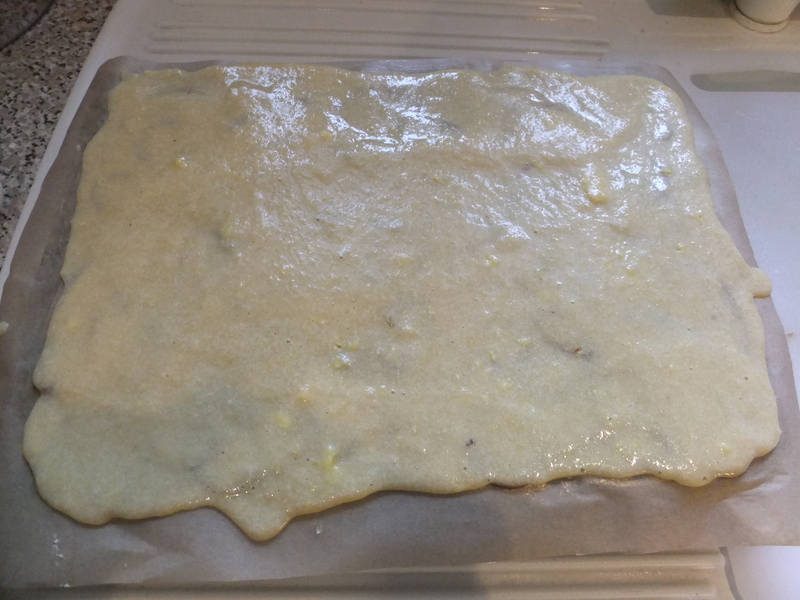 Too long and it will be too brittle to peel off the parchment. Spread the Joconde Sponge mixture over the Joconde Pattern paste carefully. * Leave to cool. 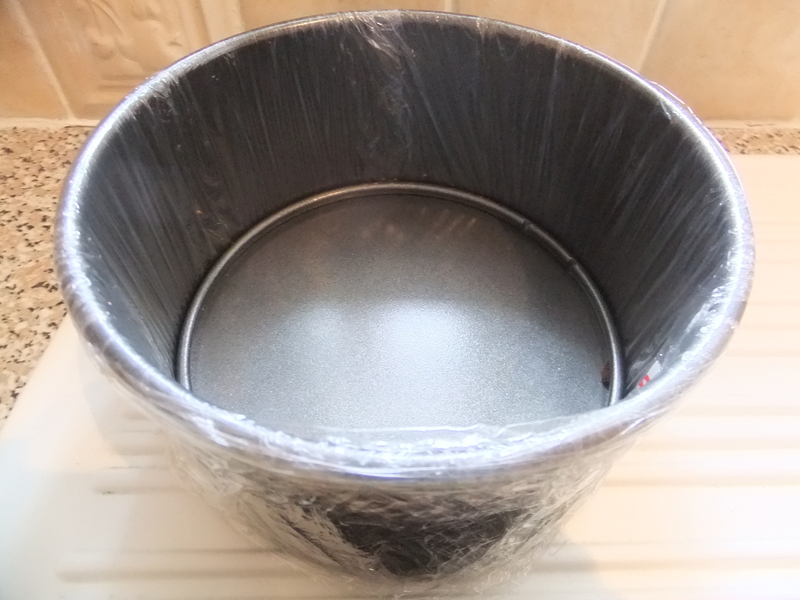 In the meantime, line a 6 inch loose bottomed tin. 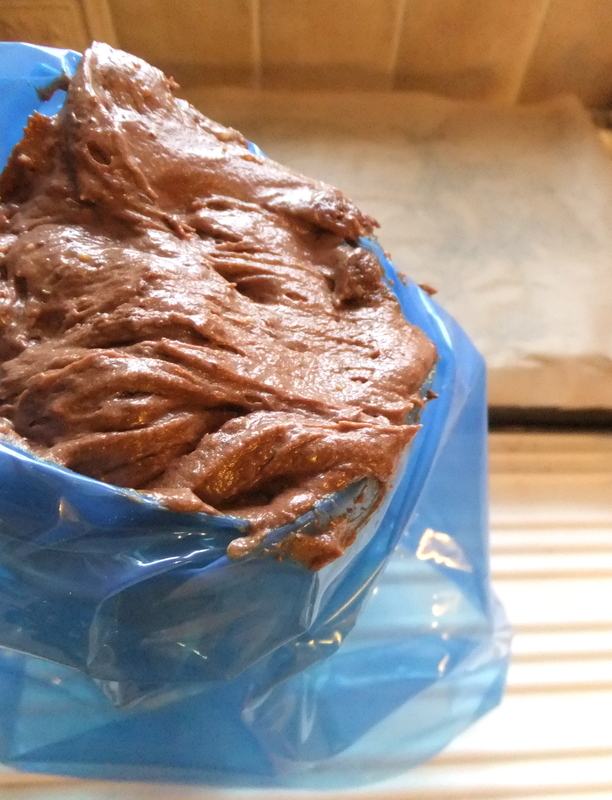 I placed clingfilm UNDER the loose bottom, then, gathering the cling at the top, slid the bottom back into the tin. 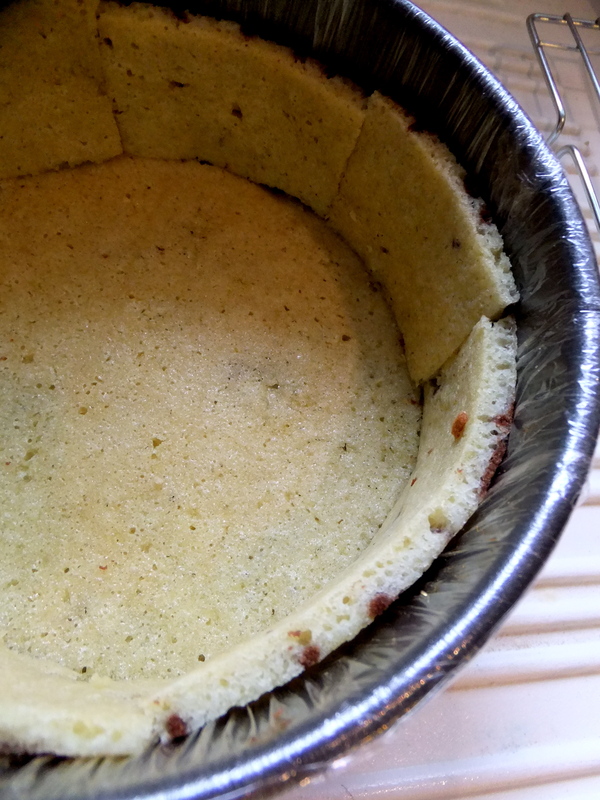 There should be no cling at the bottom of the tin, only UNDER the loose bottom, but cling along the inner edges. I then added a ring of parchment around the insides, leaving around 2 cm above the edge of the tin. Line the tin with your Joconde Imprime Sponge. * Place the sponge in the freezer to harden, ready for the ganache filling. TO COME TOMORROW : The Chocolate Ganache layer. A sewing and baking addict, vegetarian animal-lover, teacher. And an avid music fan...all the wrong sorts of music. Hence the blog was nearly called 'Hot Cake' after The Fall's song. This entry was posted in Biscuit Joconde Imprime, Sponge cake and tagged Biscuit Joconde Imprime, cake, chocolate, coffee, dessert, Entremet dessert, genoise, tiramisu. Bookmark the permalink. Aww, thanks Lisa, I’m flattered you read all of this! And thank you for the tip – last night, the youngest (Z) dipped his finger in the glace and looked puzzled. I said “What’s up?” He said, “I don’t think I’ll dip my finger in things without asking again!” What would be the equivalent of corn syrup in the UK do you think? Thank you! I have you to thank for now becoming obsessed with desserts and patisserie! As we speak my b/f and I are planning a ferry crossing to France in the summer to sample some of the delights! I’ll be sure to post photos… As an aside, any ideas for a gelatin free mousse? The mango one I made recently was ok, but didn’t quite hit the mark and there are soooo many recipes out there, it’s hard to find a definitive, foolproof one. Thanks Frau Bulmad – I aim to please… tee hee! Germany, here we come – end of August, it’s decided. The aim? To mix with the Munchen locals and find a genuine Stollen recipe…handed down by grandma. I want to eat German saurkraut with real Germans, maybe even try and find my cousins and aunties.. ??! !